I&apos;m going to put this out there: I do possess a little sympathy for Paula Deen. 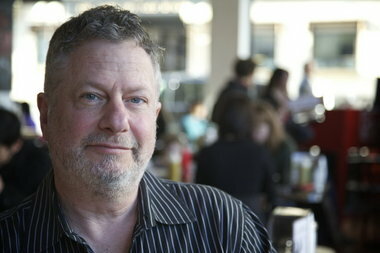 View full sizeMichael Lloyd/The OregonianKen Gordon, owner of Kenny and Zuke’s Deli, was diagnosed with diabetes early this year. He will keep a diary of his efforts to help improve his condition with diet and exercise. I’m going to put this out there: I do possess a little sympathy for Paula Deen. For those of you just back from a seven-week trip to a distant galaxy, Deen is a celebrity chef, TV food personality and prolific cookbook author who recently announced she had Type 2 diabetes. Right about the same time I did. Except that relatively few people know who I am and everyone — save the aforementioned space travelers — seems to know (and have an opinion about) Deen. The problem with the announcement is that Deen, a Southern chef who has been spreading the word for years about over-the-top, fat-drenched, salt-laden, carb-infused versions of her native cuisine, evidently has had the ailment for more than three years. No issues there yet. But her revelation was paired with another announcement: She was now spokesperson (and shill) for a Danish pharmaceutical company, Novo Nordisk. There are those with diabetes who have to take medication. No one can fault them for that, nor the drug companies for supplying them. And Deen may be one of these folks, and again, no blame there. But Paula Deen’s crime is that she gives lip service to a lifestyle replete with the moderation needed to deal with her diabetes, but at the same time defends the deep-fried bacon and Twinkies that brought her fame and, presumably, her disease. All while simultaneously pushing the drugs as the cure-all. Unfortunate, to say the least. At the same time, I have to feel for her. Talk about being caught between a rock and a hard place. She’s built an empire based on delicious, ridiculously unhealthy food and zap! — a blood test or two, and before you can say “chicken-fried steak” — the foundations on which it was all built are brought into question. It’s as though some study found that lard and fried foods were bad for you. Here’s the thing: She is! The food-sentient public — which is most of us — has glorified Paula Deen and other celebrity chefs for leading us down the road to temptation. We love delicious food, and that often means fat and salt. That’s what makes our mouths water. And for chefs, providing luscious food is their reason for being. True, every once in a while one of them will demo something healthy (or healthier) on their show or include a low-fat complex carb dish in their book. Mostly by accident or coincidence, I suspect. And there are chefs — God bless ’em — who specialize in a healthier cuisine. But the real stars of this world are mostly — like Deen, and like me — the purveyors and displayers of a rich and rarified and calorie-filled product. And for the most part, the public eats it up and comes back for more. But these stars are just the tip of the foie gras. Look at most restaurant menus: If you’re on any kind of a restricted diet and are wary of refined carbohydrates, saturated fats or sodium, well, game over. At high-end hangouts for foodies or working-class hash houses or Portland’s food carts or suburban chains, it’s pretty much the same story: There’s not a whole lot, if anything, that you can order as is and feel virtuous about eating. Instead, you have to do what I call “the dance.” You know … the dance: “Um, Ashley (the server who so graciously provided her name), could you ask the chef if he’d make the sea scallops with the sauce on the side? And, um, no pork belly? And could you ask him — pleeeeease! — to put the duck fat mashed potatoes on the side? At which point Ashley, with brave face but inwardly cowering, has to face the chef, fresh from his recently completed court-ordered anger management course. And who, begrudgingly and begrumblingly, acquiesces to the wishes of the now-classified-as-demanding diner. I’ve gotten a lot of mail so far on this column, and it has been overwhelmingly positive. The stories and recommendations and sharing have been heartfelt and, at times, heartbreaking. If there has been one consistent theme through most of them, it has been the frustration with having to participate in the dance. But diners have a role in this dynamic. It does, after all, take two to tango. And I think there are alternatives to ordering watered-down dishes if you have health concerns. I’ll explore those and some of the joys and perils of eating out, where I now like to do it, and what can and should be done about the dance.